You are looking at four (4) cartridges. MPN: SMCB-2510 BY HYDRONIX WATER. THIS IS EQUIVALENT TO CBU-10 BY PENTEK. 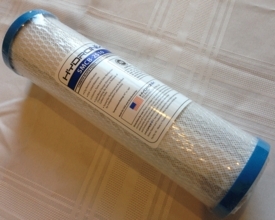 0.5 micron carbon block cartridge 2.5" dia x 9.875"L Carbon Block(CB) water filter cartridge by Hydronix Water. The CB cartridge is also known as CTO cartridge, because it removes chlorine (C), taste (T) and odor (O). It will also remove organic matter from water by adsorption. The 0.5-micron cartridge will also remove sediments and suspended matter larger than 0.5 microns. This filtration takes place without channeling, fluidizing, bypassing or release of carbon fines. Carbon used is 100% from coconut shell. The product is certified to meet industry standards for taste and odor. This cartridge can be used in any 10" filter housing. Flow in this cartridge is radial and flow rate in the filter should not exceed 0.5 gpm for optimal performance. Replace the cartridge every 20,000 gallons or once year. 10-micron Carbon Block Filter Cartridge 2.5"x10"